Probe with High-Resolution extra tip for enhanced resolution imaging. High-Resolution Cantilevers (HRC) are SPM probes that have an extra extremely sharp diamond-like carbon tip (with a typical curvature radius of 1 nm) grown by means of a Chemical Vapor Deposition (CVD) process in plasma at the very apex of the conventional silicon tip. This method was developed by Dr. Klinov. Diamond-like carbon tips can be grown on any standard probe series (by special request). The outstanding feature of the extra tip is a sub nanometer curvature radius. With the new HRC, it becomes possible to achieve very high resolution of nanometer-sized objects such as single molecules, ultrathin films, porous materials, etc. High-Resolution Cantilevers are more hydrophobic and suffer less contamination than silicon ones. The new probe is sufficiently wear-resistant to obtain many routine scans without loss of resolution. TEM image of HRC tip (length ~200 nm, apex radius ~1 nm). 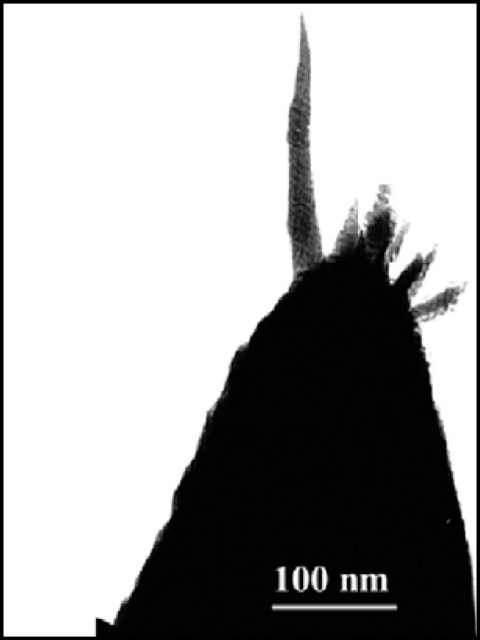 The inset is a magnified image of the end of the most protruding tip, demonstrating its small effective diameter as compared with the diameter of a typical commercially available Si tip (radius = 10 nm, continuous red line). 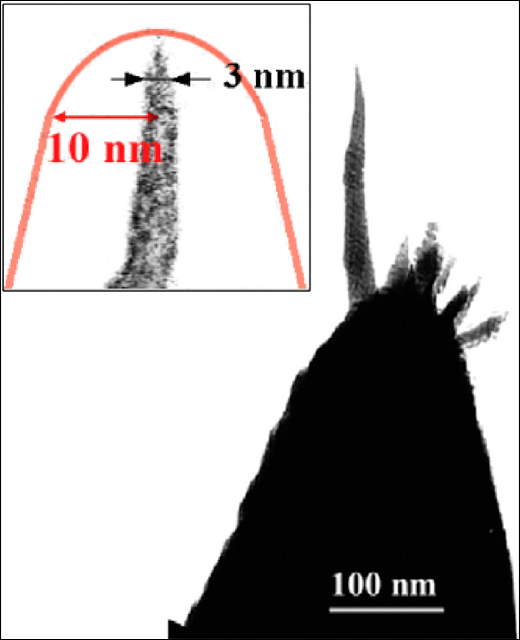 The TEM micrograph shows the different orientation of the spikes grown at the Si tip. In spite of the multiplicity of tips produced by this method, there is the only one with the ~1 nm extremity that protrudes farther than the others (by ~100 nm) and is the one that contacts the sample, and thus can be used for high-resolution AFM imaging (see inset). Because of other tips, the probe should be applied on relatively smooth sample surfaces with roughness smaller than the distance between the imaging tip and the ‘secondary tips’. The quality of the tips is controlled by visualizing with an EM 100CX transmission electron microscope (JEOL, Japan). See application notes for more information. Cantilever models that are available from stock: fpN01 and fpN10 series. Other cantilevers of standard series are available on request. Rectangular cantilever (100um, 250kHz, 10N/m).